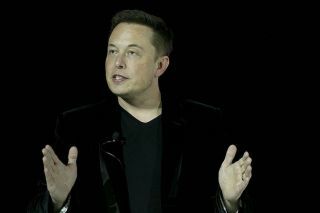 Elon Musk speaks during an event to launch the new Tesla Model X Crossover SUV on Sept. 29, 2015, in Fremont, California. Editor's Note: This story was updated at 5:10 p.m. E.T. Elon Musk recently announced on Twitter that he had received "verbal government approval" for his Boring Company to build a superfast Hyperloop transit system that would take people from New York to Washington, D.C., in just under 30 minutes. The extremely rapid transit he's envisioning will stop in New York, Philadelphia, Baltimore and Washington, D.C., Musk said in a Twitter post, adding that each of these stops would be at the city center, with about a dozen entry and exit elevators for each city. "The Boring Company has had a number of promising conversations with local, state and federal government officials. With a few exceptions, feedback has been very positive and we have received verbal support from key government decision-makers for tunneling plans, including a Hyperloop route from New York to Washington DC. We look forward to future conversations with the cities and states along this route and we expect to secure the formal approvals necessary to break ground later this year," a Boring Company spokesman said in an email to Live Science. It's still not clear how far this is from a literal pipe dream. Musk's comments don't mention who in government gave their verbal approval and whether they have final say over the project. Saying "yes" in a conversation is also a far cry from supplying all the official permits and legal approvals needed to initiate such construction. The futuristic Hyperloop would involve people boarding special pods that rocket on a cushion of air inside a low-pressure tube from one location to another. Musk has estimated that a Hyperloop pod could reach speeds of 760 mph (1,220 km/h). A company called Hyperloop One, which is not affiliated with Musk, is building a test track for the transit system in the Nevada desert. Meanwhile, in Europe, another company has built a 100-foot-long (30 meters) test track in the Netherlands, for a planned Hyperloop that would eventually connect Amsterdam and Paris. Editor's Note: This article was updated to include comments from a Boring Company spokesman.